When the movement for the creation of Abia State, from old Imo State, gathered steam in the 80s there were two critical geopolitical blocks whose buy in were key: old Afikpo and Aba divisions of the defunct Eastern Region. 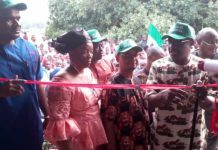 At that time, old Bende division was already sold on the need to create the state while some powerful elements in Aba division were angling for creation of Aba state using the Aba State movement. At this point let me explain “old” Bende, Aba and Afikpo divisions. In the first republic, we had eastern region (later east central state) with provinces. Provinces are made up of divisions. Each division is made up of districts. Divisions were actually large but smaller than provinces. For instance, Umuahia province was made up of Bende, Aba and later Afikpo divisions. At one time Ogoja province was made up of Afikpo, Abakaliki and Obubara divisions. Isuikwuato was actually a district under Okigwe division. Abiriba, Ohafia, Arochukwu etc were small entities inside the Bende division of eastern Nigeria and East Central state. Umuahia was a provisional headquarters and later capital of East Central State for a brief turbulent period. I can boldly state that Umuahia was the originally proposed capital of old Imo State before Owerri was settled for due to reasons I will share in future. IMPORTANT NOTE: Isuikwuato, the “I” in Abia, was NEVER a division, unlike Aba, Afikpo and Bende. 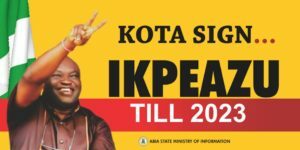 To convince Aba and Afikpo divisions to join the movement for creation of Abia State, the charter of equity was drawn up by MI Okpara and other founding fathers of Abia State. The reason was simple; without the population numbers coming from those 2 major divisions nobody would have created Abia State. The Abia Charter of Equity simply defined power rotation arrangement among the 3 “federating” blocks in Abia State. 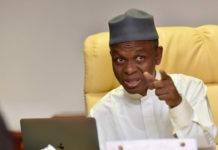 It was meant to ensure that no block is left behind in power distribution or subjugated through the tyranny of connivance of the majority or better connected block(s). To date, every Abian sees Afikpo person as his relative and they are treated as Abians to date, even after they joined Abakaliki division to become Ebonyi state. It might be key to note that from Abiriba to Ebonyi state is a 10 mins walk. (Another story for another day). It is also important to note that Abia remains the only South East state that treats all Igbo as indigenes and equal stakeholders. You shouldn’t therefore be surprised that the current Chief Judge of Abia is of Anambra State origin. Great Igbo woman that will soon be immortalized. Take note of what I have laid out above. Many false historians will lie to you about the “I” in Abia. I will tell you the truth shared with me by elder statesmen Involved in creation of Abia state. After sharing what I was told about the emergence of the ‘I’ anyone with superior information is free to come forward and contradict me. Learning is an endless pursuit. ABA was rejected for obvious reasons and someone suggested that since Isuikwuato district has joined the movement from Okigwe division the ‘I’ in Isuikwuato can be added. 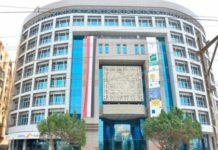 Dr M I Okpara agreed but warned then that it should be noted that it was only for naming convenience and does not equate Isuikwuato to the other 3 former divisions vis-a-vis the charter of equity. It is a historical fact that Isuikwuato leaders later came to Abiriba to formerly join Old Bende block. 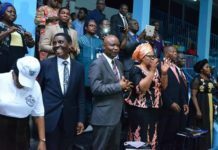 Late Chiefs Nnanna Kalu, John Okam, Obewu Ukaegbu and Dr Anagha Ezikpe participated in that meeting alongside other leading old Bende children. Since then we see Isuikwuato as old Bende people and we are proud of their contributions to our great state as equal stakeholders. Great brothers. Important fact to focus on. Following the creation of Abia, Ogbonnaya Onu of Afikpo division was elected Governor after meetings at Abiriba and other places that referenced our charter of equity and other variables. Abiriba Kingdom actually sacrificed her son who was running for Governor, to allow old Afikpo take the first shot at Abia Governorship in the spirit of Abia Charter of Equity. After Ogbonnaya Onuh the next elected Governor of Abia State was Orji Uzor Kalu of Igbere in old Bende division. He governed for 8 years non stop. 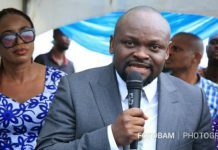 That means we have taken care of two divisions: Afikpo and Bende. Though by then Afikpo division had joined Abakiliki to form Ebonyi State. By a strange political twist in 2007, T A Orji of Umuahia, also of old Bende block, emerged the Governor for another 8 years. Senatorial zones mathematics was introduced by Orji Uzor Kalu who was bent on stopping his former Deputy, Enyinnaya Abaribe, from emerging as Governor. Otherwise power should have moved to Aba division after OUK. I still recall that around 1999 OUK promised to run a single term and hand over. But he didn’t keep that promise for obvious reasons: power is sweet. You will recall that it was Abaribe (OUK’s Deputy) that mobilized Ukwa/Ngwa people of Aba division via “otu onu” (one term only) movement against Orji Uzor’s second term in 2003. Apparently Orji was looking for excuses to deny Abaribe and his people and found plausible one in the new geopolitics of the state as per Senatorial zones. Ochendo served for 8 years. Abia has 3 senatorial zones with Orji Uzor from Abia North and TA Orji from Abia Central. That means that with Afikpo gone, of the remaining Aba and Bende blocks, the Bende block has produced 2 democratically elected governors of Abia state. In terms of senatorial geopolitics, only Abia South was left out as at 2015. It was because of that “zero” situation that Abia’s founding fathers and statesmen met with then Governor T A Orji in 2014 and told him he cannot give PDP ticket to either of his two friends/boys: Alex Otti and Uche Ogah. Both men are from Old Bende axis. I have the list of elders that went on that mission including Prof Herbert Orji. Ask him and/or Ezeogo Anagha Ezikpe, Chief Bob Ogbuagu, Chief Onyema Ugochukwu, Chief Vincent Ogbulafor, Elder Emmanuel Adaelu, Chief Ojo Maduekwe and others. Aside from Ojo others are still alive to the glory of God. They all saw the need to stop the injustice from being further perpetuated under any guise whatsoever as the consequences will predictably be devastating to our peaceful state that was just recovering from power struggle induced schism. I will highlight the consequences of denying or stripping Aba division of power till they have done 8 years later. When Sampson Ogah met some Abia elder statesmen for endorsement in 2014 they told him something I wish to share and wait for him to dispute it. 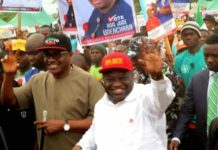 “Uche Ogah you are a young man and people love you but you have to wait for Ngwa (Abia South Senatorial zone) to do their 8 years and you can then run after Dr Okezie Ikpeazu. Your age is good but you must necessarily show patience to avoid making a fatal mistake”. I challenge Uche Ogah to publicly state that I have lied so I can provide live evidence. Somehow I know he will not dispute my account because he knows them to be true. I know he is a nice young man who did what I love: invest in Abia. But only him know how and why he allowed himself to be misled, allegedly duped of $3m and used to literally push Abia to the precipice. Just like my Abiriba people, Uche Ogah’s Isuikwuato people have produced military governors of various Nigerian states including Ndubuisi Kanu (Imo & Lagos) and Ike Nwachukwu (Imo). Abiriba produced Vice President of Nigeria and 2 Governors, Ebitu Ukiwe (Lagos and Niger) and Igboamagh (Adamawa). Abiriba and Isuikwuato are small communities compared to the very massive old Aba division currently making up 9 out of 17 LGAs in Abia. NO SINGLE HUMAN BEING FROM OLD ABA DIVISION (Ukwa/Ngwa) ever was Governor, including military and civilian governors. The first ever Ngwa man (Aba division) since God created the earth to be Governor of any state is Dr Okezie Ikpeazu. It was quite a battle for those of us that believed in equity, justice and good conscience to fight and deliver Okezie’s governorship. In addition to the need to ensure equity, he was actually the best of the lot for several reasons I enumerated during the campaigns. But I must warn that it will be Abia’s terminal war if anyone stops Governor Okezie by any means, including foul means such as the attempted coup of last 2 weeks. That will be disastrous and calamitous, to say the least about likely emergent inter-communal relationship in Abia. I can boldly state that after Governor Okezie’s first term we only have a narrow choice of either re-electing him or replacing him with someone from Old Aba division (Abia South) to complete 8 years. I doubt that some of us from old Bende division fully understand what our brothers from old Aba division will do if we fail to abide by the arrangement entered into before they joined us to create Abia State. They will simply go with their Aba commercial city and oil from ukwa area and agitate till the Federal Government hands Aba State to them. If in doubt kurum aka. You cannot stop them because you have no moral right to do so. You also lack the spiritual and physical force to stop an angry and betrayed people from responding to betrayal by their own brothers. But we can stop all that now by simply gathering together to affirm our charter of equity and allow Dr Okezie peaceful reign while benchmarking him only against his performance in office. 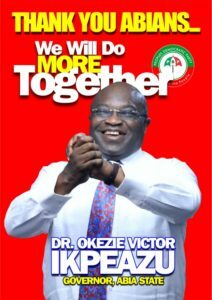 Nobody born and/or living in Abia can deny that so far Dr Okezie Ikpeazu has done well. Give him space and support to do much more. 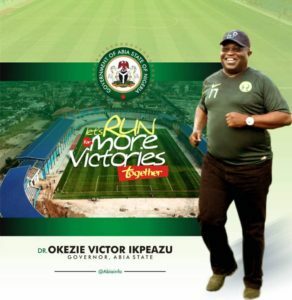 Apart from those elders and rapacious youths who wish Governor Ikpeazu share our commonwealth with them and abandon what matters to common folks, everyone is happy with what he is doing so far. Do we understand the burden imposed on us as brothers or are we blinded by political greed and short term financial benefits? 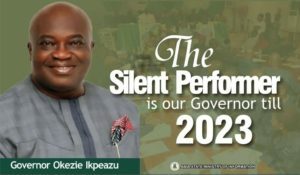 Support Governor Okezie Ikpeazu to succeed and forget about torpedoing his regime using your arrogant connections. Those connections will fail as more people come to realize what is happening. Per adventure it succeeds it will be the end of Abia as we know and agreed before 27th August 1991. Those of you collecting money from our son Ogah to write nonsense, prepare too. When the come shall come even you will become. Since you want to involve yourself in what you don’t know the background story, continue. If money that should be used to fix Abia roads, infrastructure and build private owned factories are given to you and you chop and write nonsense one day you will visit Abia and our bad roads will either kill or injure you. It is not a curse but rather a word of knowledge and advice. Stop misleading Uche Ogah and allow him to use his money to build more factories in Abia. He cannot and will not be Governor of Abia till 2023 as agreed by his fathers and mine. If he refuses to obey the agreement of our founding fathers, let the God of equity judge him and others. I personally have faith in our judiciary to vindicate innocent Governor Okezie Ikpeazu whose taxes were deducted at source and used to build Abia and Nigeria in the period under review.